C. Joseph Ou joined Gibson Robb & Lindh in 2014. Mr. Ou handles a variety of maritime and land-based cargo subrogation, workers’ compensation subrogation, insurance defense, and maritime personal injury defense matters. 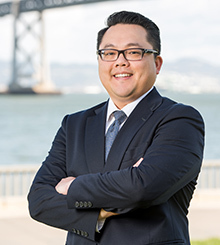 Prior to joining the firm, Mr. Ou was an associate at a general litigation firm in San Francisco. Mr. Ou graduated from U.C. Davis with bachelor’s degrees in Economics and Communications and obtained his juris doctor from U.C. Hastings. While in law school, Mr. Ou served as a judicial extern for the Honorable Laurel Brady at the Contra Costa Superior Court and worked as a legal intern for the San Francisco Mayor’s Office.